While the origin of the word is not disputed (literally meaning lid), the origin of tapas as the feast of many small dishes is highly debated. Some claim tapas came to be when a Spanish king was instructed by his physician to eat many small meals a day. Others claim tapas were simply small dishes placed on top of wine glasses to keep flies away. Regardless of exact origin, tapas is a wonderful element of Spanish life, and one equally as enjoyable when recreated at home. Our assortment features essentials for a tapas feast. Included are 3 superb Spanish cheeses: Malagon with Rosemary, Mahon, and Murcia al Vino. For meat lovers: our wonderful spicy chorizo, and the essential, perfectly cured Serrano Ham. Next, the star of the sea: top quality Spanish tuna packed in olive oil. Also: Piquillo red peppers, Spanish Olives, Artichoke Hearts and quince paste, each one providing an array of tastes and textures. Dessert: Fig Cake and authentic Spanish Torte de Aceite. Finally: No tapas would be complete without that Andalusian specialty of oven roasted almonds dusted with sea salt. Whether it's a sunny late afternoon or a cool evening, tapas is a wonderful way to sit back, enjoy some Spanish wines (or sherry), and feast on a myriad of flavors in the Spanish tradition. 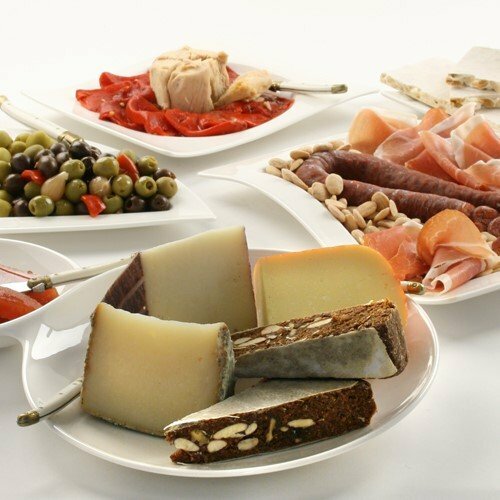 Contains cheese, peppers, membrillo, olives, almonds, boquerones, Serrano ham, and more!